Australia is a vast and extraordinary destination. From the sacred beauty of the outback, to the delightful contrast of rainforest and reef, and the cultural bustle of cosmopolitan cities, the sights are as spellbinding as they are plentiful. Enjoy those sights, sounds and flavors, and experience the pleasure of boutique travel, with Inspiring Journeys. 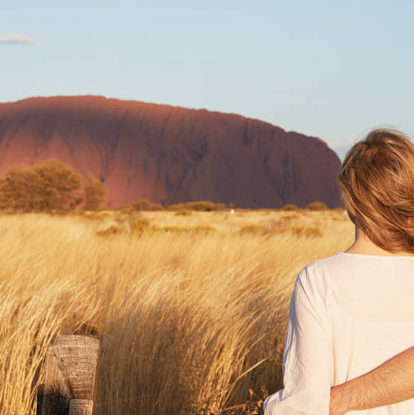 Featuring the splendor of the Red Centre, the tropical delights of northern Australia, and the iconic Sydney Harbour, the 13-day Inspiring Australia journey punches well above its weight. Comprising no less than 11 destinations, the journey captures the spirit of Australia and its most important landmarks without rushing from stop to stop. Plus, the unparalleled expertise of your dedicated Journey Director will ensure your adventure is truly authentic. Walk the majestic Mereenie Loop in the soaring West MacDonnell Ranges. The journey begins in Cairns, the gateway to Tropical North Queensland. Discover the magic of the World Heritage-listed Daintree Rainforest and its Indigenous significance before exploring the kaleidoscopic wonders of the Great Barrier Reef. Next stop, Alice Springs and a chance to explore the unique beauty of outback Australia. Rich, red earth, colossal canyons and towering rock formations illustrate the next few days. In Uluru, the awe-inspiring sight of ancient rocky domes is further enhanced by the renowned Sounds of Silence dinner, a five-star al fresco event held under the Southern Hemisphere’s dreamy blanket of stars. Off to Australia’s famous harbor city, Sydney, and what better way to experience the glittering setting than on the water? Kick back on a luxury yacht and take in the view, including the Sydney Opera House and Harbour Bridge. Return later for five-star dining under those legendary Opera House sails. Delight your senses on Sydney Harbour and the famous Sydney beaches. As well as the Inspiring Australia itinerary, Inspiring Journeys offers a range of Australian itineraries from five to 13 days. Inspiring Journeys’ tours comprise no more than 20 travelers, creating a more personal experience, one you’ll never forget. For more information, please visit inspiringjourneys.com or call 1-866-240-1659.